After being processed and confirmed your booking, tickets will be sent to the email with which the reservation was made. 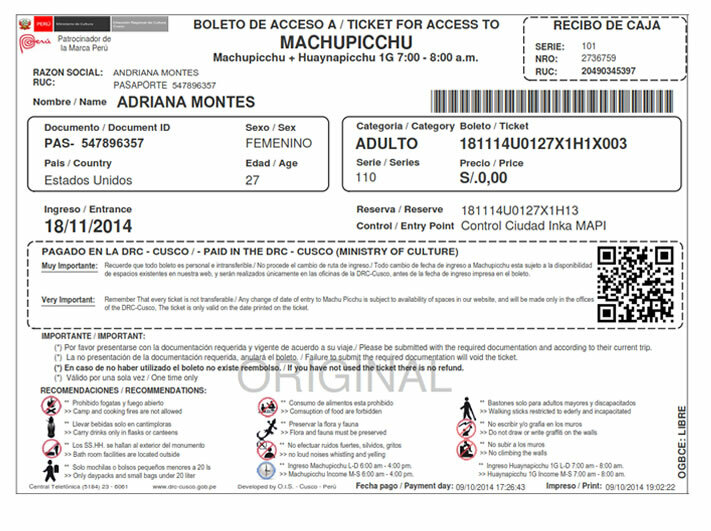 Printed tickets must be presented in the access control of the Citadel of Machu Picchu. In the inbox of your mail you will find one of our email with the printable version of your Ticket Machu Picchu. This document must be printed and then are be shown in the Access Control Machu Picchu. To validate this admission ticket you will be asked to present your ID, Passport, or Student Card as appropriate; is important to remember that this document must be valid until the date of your visit. Failure to submit the required documentation will void the ticket. Any change in the entrance to Machu Picchu is subject to availability of spaces available on our website and will be made ​​before the date printed on the ticket income. Furthermore, these changes have penalty that varies according to the time the application is filed. The entrance ticket to Machu Picchu valid for only once. Remember that every ticket is not transferable. Camp and cooking fires are not allowed. Carry drinks only in flasks or canteens. Bath room facilities are located outside. Only daypacks and small bags under 20 liter or 9 kilos. Consumption of food are forbidden. Flora and fauna must be preserved. No loud noises whistling and yelling. Walking sticks restricted to elderly and incapacitated. Do not draw or write graffiti on the walls. Machu Picchu Income; Monday – Sunday 06:00 – 16:00 hours. Huayna Picchu Group 1 Income; Monday – Sunday 07:00 – 08:00 hours. Huayna Picchu Group 2 Income; Monday – Sunday 10:00 – 11:00 hours. Machu Picchu Mountain Income; 07:00 – 11:00 hours. Machu Picchu Museum Income; 10:00 – 16:00 hours. If our service was satisfactory, please leave your comments in our testimonials section. ← 4 Types of Tickets to Machu Picchu Which one to choose?